Here are my notes from the PLVN ICT Special Interest Group Digital Literacy Seminar, held in Melbourne on 3rd June 2015. Victorian Public Libraries: Our Future, Our Skills Research Report 2014 – http://www.plvn.net.au/sites/default/files/Skills%20Audit%20Report%20FINAL.pdf. 98% of libraries completed survey, 79% of managers. Good basis for skills audit. Public Libraries 2030 came out with two broad scenarios. – Community and Creative. Role for libraries in this and a great need for libraries to upskill their staff. Patrons come to learn new skills or to collaborate in our spaces. Figure 44 from Skills Audit – big mismatch between what is required in future by managers and how confident staff feel about those skills. Not disastrous, but we have some work to do. We have an advantage in that staff have rated their confidence in lifelong learning higher than managers’ expectations of where it should be. Statewide Projects through PLVN – since 1995, about collaboration, involved the creation of the special interest groups and in collaboration with State Library Public Libraries Unit. Past projects include Libraries building communities, Dollars and sense, Internet and PC usage, Memory Victoria, Shared Leadership – all with reports available from the PLVN website at http://www.plvn.net.au/. Back in 2010 were looking at more long term strategic planning which led to the Libraries 2030 report, which was launched June 2013. NSW Bookends project is an interesting comparison to Libraries 2030. There are workgroups for each project comprising SLV specialist staff and public library managers. Lead and Learn group is responsible for rolling out recommendations from the Skills audit. Now we have the 2015 Workforce Development Action Plan. Gave a long list of needs to work on in future but needed a focus for the next three years. Skills gap table – what’s important in future definitely includes digital literacy. The core competencies cover digital literacy, social media and mobile apps, ICT support. Working group has received a grant from the RE Ross Trust for the project. This funding will help to develop and deliver online digital literacy modules. Digital Literacy – build confidence in staff and develop their capacity to learn. It has to be practical, supported by other staff and ongoing so staff can pick up the next level when it appears. It aims to bring people to the same base level and is aimed at Bands 3-6: the coal face staff. In future, the project will look at managers and how we can bring them up to the same level and know how important it is for staff to continue to develop their skills as things change. Aim for 1000 staff to be trained over 2 – 3 iterations. Hope to package it up at the end so it can be used on an ongoing basis. Won’t redo skills audit, but will be doing evaluations around course, before and after. It will involve the use of champions, be monitored, be confidence building, teach principles and practice, and develop learning to learn. Next steps – the Working Party to advise on content etc. work on design, development, testing and roll out of online training. Due to the requirements, they can’t use existing products, so SLV will produce the delivery model. Working party will be workshopping what the content will actually be. This is not the answer to everything, but it is a big step in the right direction. 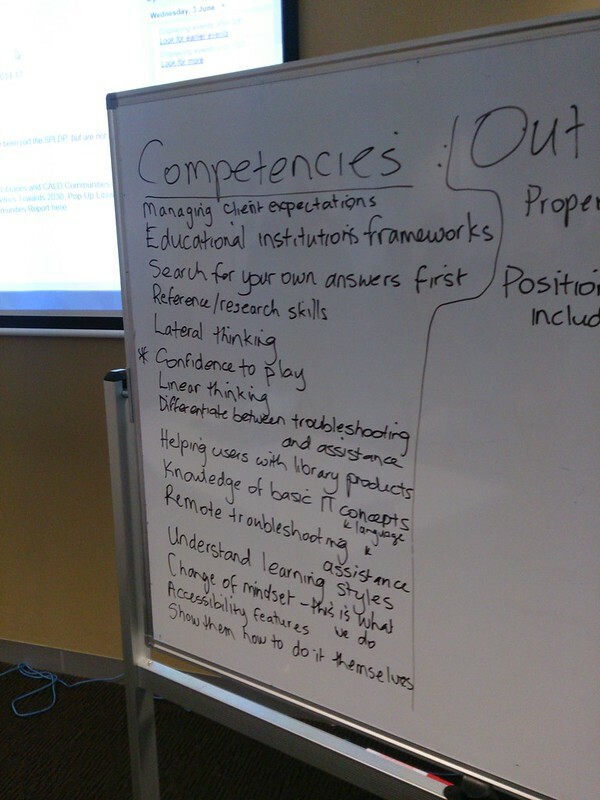 We need to determine what the base level of competencies regarding ICT are. IMPORTANT! Staff are representative of our communities so have early, late and non-adopters amongst them. When e-books and tablets hit, not all staff came on board. They realised that they hadn’t built a culture of learning, so staff felt it was unreasonable to expect. They have now built a culture that it is everyone’s responsibility to continue to learn. With digital skills every branch has a champion to help staff keep on top of the basics. Need to talk about a culture of learning all the time, not just when you are forcing them to learn. They demonstrated a Skills checklist which was self-assessed. They encourage staff to reinforce their skills by teaching someone else. Initially focused on library e-books and e-magazines and developed checklists to cover the most common queries from users. This has been a great confidence builder for staff and has given them options of what can be done and when to refer on. Problem with staff saying that they needed more training when they forgot how to do something – at that point they thought the solution was more formal training. It is now in the work culture at staff meetings, their library service staff day and in the day to day. Staff can be motivated by appealing to their desire to provide good customer service. Use different learning strategies to help staff – analytical, personal and informational. Can use pilots and try outs, buddying, just in time learning, and more formal training. Staff love sharing their knowledge. Eastern Regional surveyed staff on IT competencies and got some interesting results. Their staff had lots of smart phone ownership and used them for SMS’s and photos. They also found lots of social networking with the vast majority of staff on Facebook. However, the survey was likely completed by tech savvy staff. Lots of staff have worked on Facebook privacy settings, so they have the motivation to learn. E-learning one to ones, originally for library users but now made available to library staff. Covers work email, calendars, contacts, apps and more. Often have a follow up to ensure all is going as it should. Library staff can attend technology events for library users such as workshops, computer support clubs etc. They have had instances where staff have attended an event, have engaged with the content and now teach it. They have staff and patron guides as follow up to a course. eg. iPad quick start guide. For staff the guides are around photo consent, calendars, contacts, apps and taking photos. They are using Piktochart to create their guides. They have subscribed to lynda.com for both staff and user training. For every minute of watched course for work, staff can watch one of their choice. This training is included in appraisals. They are looking at setting up staff specialities – aim to weave passions into their library work, eg. cooking interest becomes expert on Zinio. Hume runs sessions called Discover – can be up to two hour sessions running quarterly. Sessions often run much shorter and are sharp. They rotate across main branches and in am and afternoon slots. Linked to the staff review process and aim at 75 percent attendance either in person or podcast. Some have been mandatory. Hope to have webinar format in future. They are usually in-house training. Not just technology but have included Zinio e-magazines, Hume’s appropriate use policy, Enterprise discovery layer, Axis 360 e-books, Trove, Borrowbox e-audio and e-books, E-Smart Libraries. 100 percent of staff have attended at least 50% of sessions. Sessions are very interactive, and they let it take a generic form. Sessions are followed up by a quiz which is mandatory. Anybody can present – just go through the process. They have never had a session cancelled and they are also open to Council staff. They have an IT support team, a New Technologies Coordinator and learning coordinators at each branch. Run online courses and have an e-list with tips etc. which is compiled by the New Technologies Coordinator. Have an annual training calendar for staff. Staff are also able to attend training offered by Whittlesea Council. They are improving digital literacy by recognising technology is core to the service – no specialised IT staff, and creating a culture of lifelong learning. Staff are learning facilitators who are about helping users to learn to help themselves. Lots of formal training but also informal including: a shared calendar, Yammer for staff communication, iPads for ready reference and shelf reference roster, Google Docs for collaboration and the casual availability list. Use of these resources subliminally raises skill levels in the use of IT. They highly recommend that you pre-test and have trial runs with everyone before you launch a product. Staff are responsible for entering events and blogging and branches maintain their own Facebook pages. All staff are encouraged to enter events and blog; they now have a group to post on Facebook. Staff are also encouraged staff to do free online courses eg. Udemy, GCF Learn Free etc. E-Smart Libraries has been a useful tool in identifying gaps in staff knowledge. Challenges: – resistance to change, tech isn’t cheap, tech is evolving, inequity of resources. There is a lot to learn and user expectations are high. Need support from managers and IT. They also have the challenge of a wide range of user needs at different libraries – from quite basic at some libraries to very advanced at others. Nathan was encouraged because we are all in there, doing something about digital literacy. Asked what will be asked for in future – VPNs, TOR? AT present, their training core is around their new upcoming LMS. However, two new libraries are focused on skills training which is what users are asking for. Boils down to cultural change – have to be a lifelong learner now to keep up. They are working on a Digital Strategy – very broad, it’s an agile document. The Dock has delivered over 100 workshops on creative processes – 1500 attendees but massive wait lists. Staff are encouraged to get the basic admin tasks done and then work with users and developing programs. They are trying to develop the culture of play for staff. Brought Stephen Heppell in to motivate and encourage. Training was about learning through doing. Technology breaks all the time – this can help the less confident staff, once they realise that it will break for anybody, not just them. They are going to incorporate a staff play day once a fortnight and have subscribed to lynda.com.